It was my intention from the outset to post every day when I started this blog…all wide-eyed and bushy-tailed, and hey, I did do 19 posts without faltering. I don’t care to go and check the date of my last post as it will remind me of my absence, for which I apologise. I am hoping to regain strength and get back to blogging this week. My absence has been a combination of a few things I guess: to some extent the shiny newness of blogging had worn off a tad, I was very distracted with my youngest son going to New York for a month (my little boy in the Big Apple—and on the other side of the globe!!! ), but mostly it was because I have started studying at university after a 30+ year gap. My course is on sustainability and it was what I needed to do—as a person who has a head full of questions! And, good or bad, it consumes and challenges me. So, as much as I intended this blog to just reflect the things we are doing in and around our little suburban block, it may become peppered with the things that are challenging me as I navigate the ‘wicked issues’ presented in the course—in particular climate change. Above is a picture taken a few weeks ago of the bay—just down the hill from our home. It is lovely spot—always changing in mood, but on this day, caught in calmness. It’s a great place for walking, bike riding and, on the odd occasion, swimming. As a taste of what’s been occupying my thoughts, below is the poster I produced for my first assignment on Coal Seam Gas, which I handed in today. 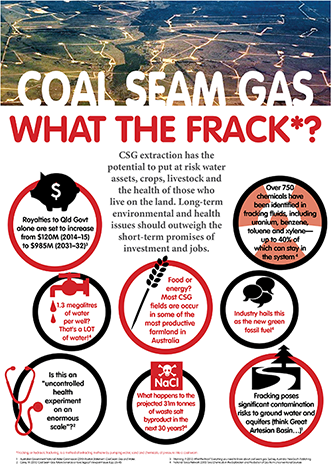 Tags: coal seam gas, environment, sustainability, tracking. Bookmark the permalink.